Knotty Hickory Cabinetry Features Solid Knotty Hickory 5-Piece Door & Slab Drawer Front. Learn More Below. 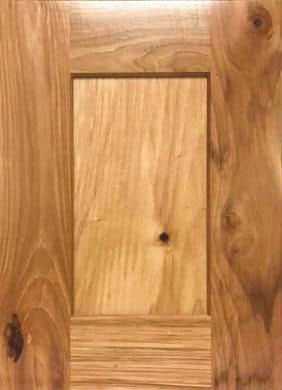 This recessed panel square style door has Solid Knotty Hickory cope & stick door frame, Solid Knotty Hickory center panel, slab style drawer front in Solid Knotty Hickory. Color/Accent: Natural stain finish with. Finish: Pre-catalyzed lacquer finish. The nature of this wood is variable markings, depth of markings (knots) & grain; these are not considered defects. 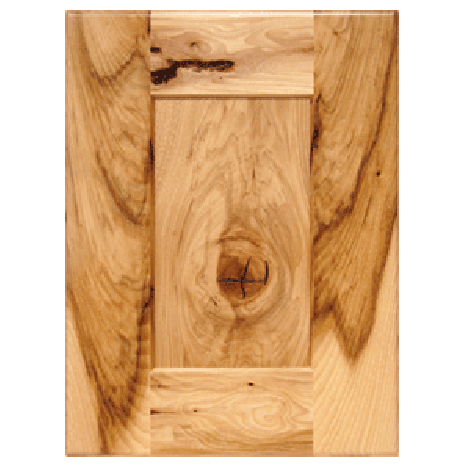 We recommend ordering a sample door as computer screens sometimes do not show all the detail and color accurately. Sample door is 12" X 15".